The Camaro was in its last year of the turret headlight look in 1973. Engine choices for this year were a 250 I6, 307 2bbl V8, 350 2bbl V8, 350 4bbl V8, and a 350 High Output 4bbl V8 (Z28 only). You could back these engines with a 3-speed manual, 4-speed manual or 3-speed TH350 automatic. The mid-70’s were a dark time for the beloved Camaro as horsepower and performance took a back seat to economy and comfort, two things these vehicles were not known for. Camaros received a more aerodynamic appearance for ’74, which included a revised nose and front/rear lighting, but still had the vision-hindering flat rear window. The Z28 package found its way on to a few of the cars as well, but was criticized for adding more sport-car styling than sport-car performance. For ’75, the Camaro, along with its Pontiac Firebird cousin, received a new wrap-around rear windshield. The Z28 option was put on hiatus for 1975 & 1976. Chevrolet tried to bring attention back to the Camaro line with the “Type LT” model, which came with a standard V8 and higher-level interiors. By this time, the best engine available for the Camaro was a 145 horsepower 350. 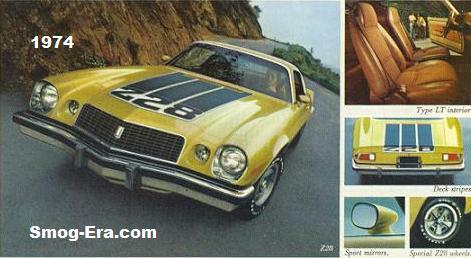 Z28 returned for 1977, but relied on tight handling rather than raw power. T-Tops also became available around this time after their success on the the Firebird. Body-color front and rear bumpers helped modernize Camaro’s look in 1978, and the following year a “Berlinetta” package was offered for buyer who wanted more luxury in their sport coupe. The same basic car stuck around until the 1981 model year, though several new engines were added for 1980. These were the 231 Buick V6, the 229 Chevy V6, and 267 Chevy V8. Big news was the 1982 model year, the complete generational change for the Camaro. Totally redesigned to be smaller and be lighter, plus included quad headlamps, and a new hatchback body style. Engine choices for ’82-’83 were a 2.8 liter V6 (102hp), 305 4bbl V8 (145hp), 305 HO TBI V8 (165hp), and the most ‘daring’ of all, a 2.5 liter I4 (90hp). The V8s were in front of automatic transmissions only. Trim levels for these years were base, Berlinetta, and Z28. The Camaro was at its low point, but some of the quickest and best were only a couple years off.